For the first time since I started reporting these numbers, we have a new leader. 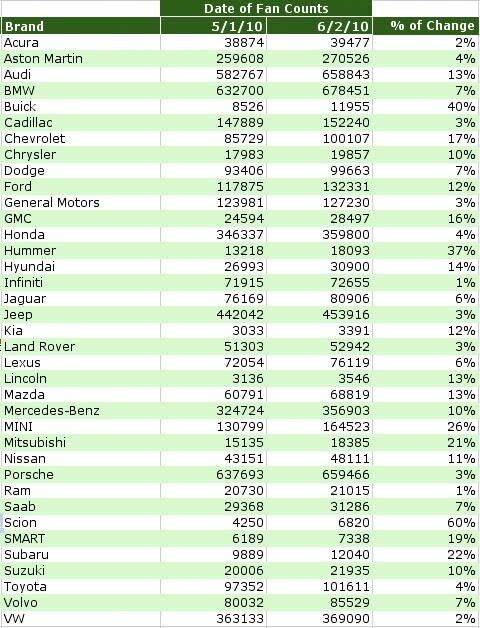 BMW overtook Porsche this month. 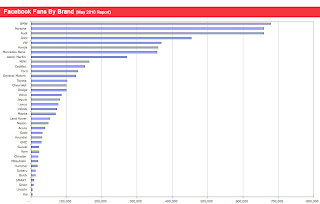 BMW’s lead may not last long as Audi is gaining followers at almost two times the rate BMW is and Audi is only about 20,000 followers behind BMW. 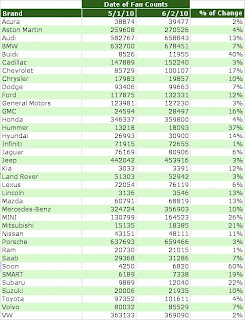 Audi gained 13% while BMW gained 7% in May leading me to believe the top spot may change hands quite a bit between BMW and Audi. Porsche’s growth is a mere 3% and hasn’t been strong in awhile so I expect them to stay out of the lead unless the company decides to spend marketing dollars for Facebook fans. Besides a new champion and threatening soon to be champion, not much else is going on in the automotive Facebook Fan world. 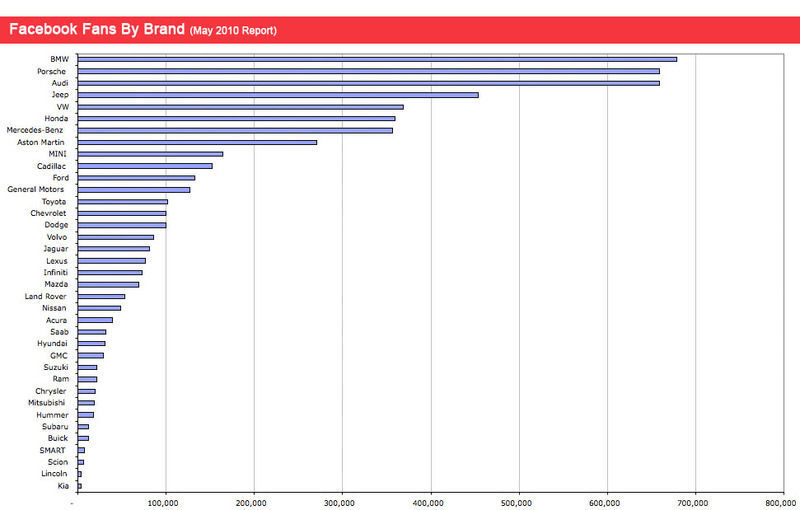 Scion has the biggest surge since establishing their “official” fan page a couple months back. 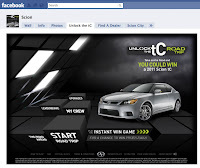 They are running a new promotion called Unlock the tC Road Trip. The contest uses Facebook Connect and game players can recruit their “Crew” using their Facebook friends. 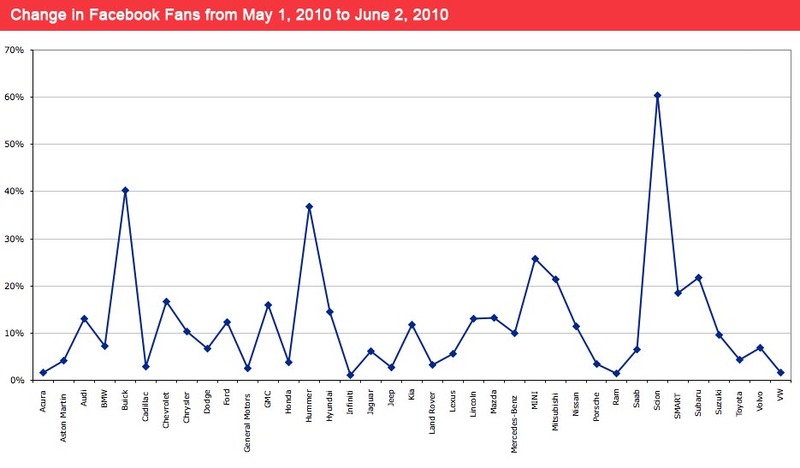 The game just launched June 1st so other than some early promotion it probably has little to do with Scion’s surge of fans, but the new game could impact fan growth in the coming two months. One trend I am seeing is in use by Honda. The use of a custom Facebook tab to use for contests is becoming very popular since it is another avenue to attract people to a contest promotion, particularly people who have already demonstrated interest in your brand or product. The Honda Civic vehicle fan page markets the Civic Tour which has been going on for several years now, but I believe this is the first (or possibly second time) Honda has used Facebook to feature the event on its fan page. The Honda Civic Tour example is more of a landing page message that jumps the user to a microsite, which allows for contest entry and more details (checkout the Honda Civic Tour site.) This is becoming very common as Scion too is following the same approach with their latest sweepstakes/contest. This month I wasn’t served any automotive “become a fan” ads on Facebook. It’s possible Facebook is getting more intelligent with its ad serving or there just isn’t the rush to gain Facebook fans that was going on late last year and earlier this year. 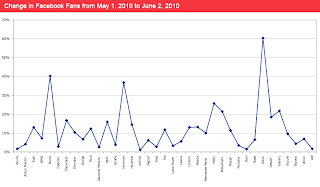 The more modest growth numbers tell me companies are not buying “become a fan” ad buys right now and maybe finding other methods of marketing their Facebook presence like adding Become a Fan to their website or email materials.